Most Christians are interested in the growth of the church. They are particularly concerned about the growth of the local congregation to which they belong. They sincerely wish they could do something that would help the kingdom grow. There are many things every Christian can do to this end. Perhaps none has a more measurable impact than a simple invitation. Researchers have compiled the data and uncovered an interesting fact. People coming to Christ indicated that of all the factors involved one stood out. It actually soared above the rest. More than seventy-five percent of the people who decided to follow Jesus did so because someone invited them to take the first step! 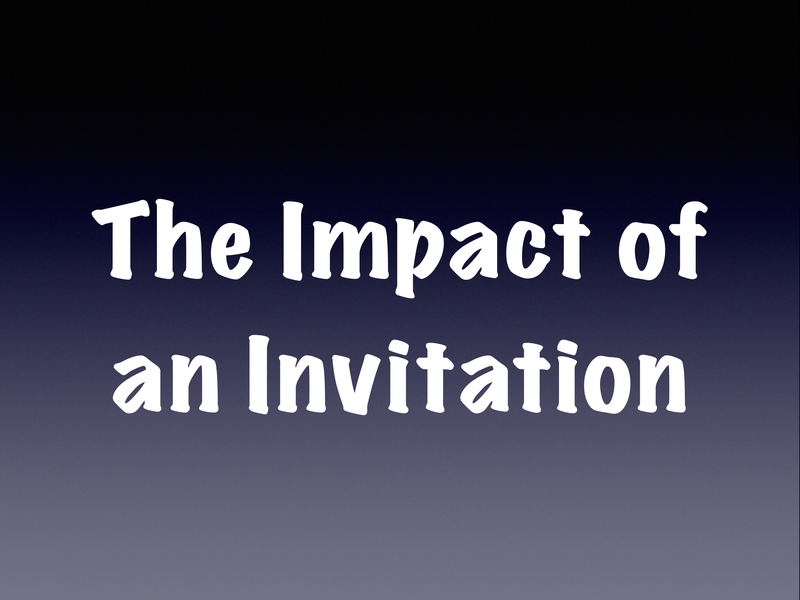 The impact of an invitation cannot be over emphasized! These are compelling numbers. At least three out of four people coming to the Lord start their journey of faith as a direct result of a friend taking an interest in them and inviting them to do so. What would happen if more invitations were given? What if every member made it a point to invite one person to Bible class or worship services each week? We would probably have more opportunities for Bible studies than we are prepared to handle! But, that is another subject for another time. Remember that this statistic represents precious souls—souls led to the Lord because someone cared enough to invite them into a closer relationship with Jesus Christ! Never underestimate the power of an invitation. Whom can you invite? The “art” of inviting others into our lives has become a challenge more than a joy. The fear of being ridiculed, rejected, and refused is a well developed tool of satan’s. For women, the fear hits all of the physical comforts that merge with our identification as women, therefore, by not readily inviting others into our homes, keeps all that we guard somehow “safe”. In reality, the guarding and refusal to be vulnerable to our Christian brothers and sisters is the real testament that others see. It would be, and is easier to invite strangers to our dinner tables than the ones we are to spend eternity with. Brad and I are hoping to make a change in this view. It is, and has been, our goal to invite each and every soul who attends worship service with us this year to our table for a meal together. When this list has been exhausted, we will now add to our list the “strangers”. Thank you my friend for this reminder of who we aspire to be and not who we tend to be.